For other ships with the same name, see List of ships named HMS Beagle. Propulsion: Four Lister Blackstone ER58M 8-cylinder diesel engines, 2,640 bhp, twin screws, variable pitch propellers. HMS Beagle was a Bulldog class coastal survey vessel of the Royal Navy and was the ninth to bear the name. She was originally to have been called HMS Barracouta but her name was changed to HMS Beagle in honour of the ship which carried Charles Darwin. She was built by yacht builder Brooke Marine, to commercial, rather than military, ship standards at a cost of £53,000,000 at 2007 prices. She was launched on 7 September 1967 by Mrs. GS Ritchie, wife of the then Hydrographer of the Navy, Rear Admiral GS Ritchie CB DSC FRICS and commissioned the following year. She was the last Royal Navy vessel to have wooden (over steel) decks. During her Royal Naval service BEAGLE travelled throughout the world from the Indian Ocean to the West Indies and Scotland to South Africa. Originally designed to work in pairs, since the early 1980s BEAGLE generally worked alone around the UK shores progressing the areas not covered by side-scan sonars. Following a half-life refit in 1990, Beagle was fitted with the most modern Surveying Information Processing System (SIPS) which revolutionised the way sheets were drawn and surveys conducted. BEAGLE had a ship's company of 45 Royal Naval personnel, and was classed as a Warship under the White Ensign. The well-equipped galley, situated on 2 deck amidships, fed the whole ship's company to a very high standard. 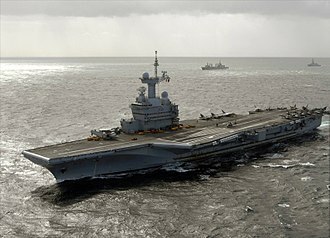 The Wardroom, just to starboard, the Senior Rates Mess just aft and the Junior Ratings mess forward, all having easy access. All accommodation, except the Captain's, was on 3 deck. The Junior Ratings had a 28-berth mess deck forward, the Senior Rates lived in double cabins and the Officers had a mixture of two double-berth and two single-berth cabins. All accommodation spaces were air conditioned and this coupled with good sea-keeping qualities made these ships very comfortable indeed. Specifically designed for Hydrographic Surveying, she was extensively modernised during her life with the original 28 ft survey launch being replaced with a 31 ft survey launch "FitzRoy" and the original 18 ft survey launch replaced with a Sea Rider RIB and associated davit. Designed originally to carry a SWB Land-Rover on the focsle, to be lifted on and off with the forward crane which also plumbed the forward survey hold. Of the four ships in the class, FOX was sold in 1989 FAWN in 1991 and BULLDOG in 2001. BEAGLE was affiliated with the Devon town of Newton Abbot, the Norton Fitzwarren Royal Naval Association, the 2nd Gosport Beagle Cub Pack, Ruthin School CCF & the Bulldog, Beagle & Boadicea Old Crews Association. She served in the Royal Navy until 7 February 2002 when she was paid off. She was sold in March that year for £750,000 to a yacht company in Poole for conversion. In 2002 she was refitted into a four deck luxury yacht and renamed MY Titan. She is able to sleep 22 guests and accommodate 20 crew. Wikimedia Commons has media related to IMO 4902921. Balclutha, known as Star of Alaska, Pacific Queen, or Sailing Ship Balclutha, is a steel-hulled full rigged ship that was built in 1886. She is the square rigged ship left in the San Francisco Bay area and is representative of several different commercial ventures, including lumber, salmon. 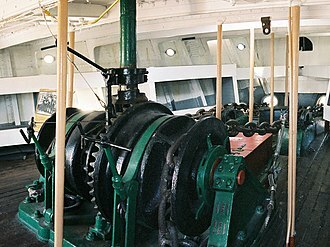 She is a U. S. National Historic Landmark and is preserved at the San Francisco Maritime National Historical Park in San Francisco. She was added to the National Register of Historic Places on 7 November 1976, Balclutha was built in 1886 by Charles Connell and Company of Scotstoun in Glasgow, for Robert McMillan, of Dumbarton, Scotland. Designed as a trader, Balclutha rounded Cape Horn 17 times in thirteen years. During this period she carried cargoes such as wine, case oil, and coal from Europe and these included Chile for nitrate and New Zealand for wool, Burma for rice, San Francisco for grain, and the Pacific Northwest for timber. In 1899 Balclutha transferred to the registry of Hawaii, and traded timber from the Pacific Northwest to Australia, in 1902 Balclutha was chartered to the Alaska Packers Association. After having struck a reef off of Sitkinak Island near Kodiak Island on May 16,1904, for this trade she carried over 200 crew and passengers, as compared to the 26-man crew she carried as the Balclutha. In 1911 the poop deck was extended to the main mast to accommodate Italian and Scandinavian workers and this expansion is called the shelter deck. In the tween deck, bunks for Chinese workers were built and her last voyage in this trade was in 1930, when she was laid up after her return home. In 1933, Star of Alaska was renamed Pacific Queen by her new owner Frank Kissinger, in this guise she appeared in the film Mutiny on the Bounty starring Clark Gable and Charles Laughton. She eked out an existence as a ship, gradually deteriorating. In 1954, Pacific Queen was acquired by the San Francisco Maritime Museum, in 1985 she was designated a National Historic Landmark. 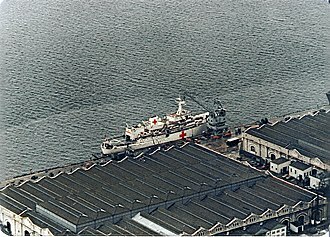 In 1988, she was moved to her present mooring at Hyde Street Pier of the San Francisco Maritime National Historical Park and she is host to a monthly Chantey Sing in the shelter deck 8pm to midnight on the first Saturday of every month. Coronet, a wooden-hull schooner yacht built in 1885, is one of the oldest and largest schooner yachts in the world. The 131-foot schooner Coronet was designed by William Townsend and built for Rufus T. Bush by the C. & R. Poillon shipyard in Brooklyn, Bush put forth a $10,000 challenge against any other yacht for a transatlantic race. After winning the 3, 000-mile race and the $10,000 purse, Rufus T. Bush decided to sell Coronet and his son Irving T. Bush circumnavigated the globe on Coronet in 1888. Coronet was the first registered yacht to cross Cape Horn from East to West, after crossing the Pacific Ocean and stopping in Hawaii, Coronet made port in China, Calcutta and elsewhere. Coronet was sold before Rufuss death in 1890 The vessel passed through six different owners by 1905, the Coronet circumnavigated the globe several times and was used for a Japanese-American scientific excursion during an eclipse. The Kingdom, an organization founded by Frank Sandford, purchased the ship in 1905 for $10,000 and took it around the world on prayer missions. Polly Woodside is a Belfast-built, three-masted, iron-hulled barque, preserved in Melbourne and forming the central feature of the South Wharf precinct. 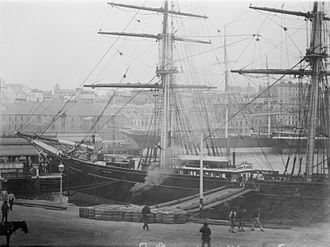 The ship was built in Belfast by William J. Woodside and was launched in 1885. Polly Woodside is typical of thousands of smaller iron barques built in the last days of sail, intended for deep water trade around the world and designed to be operated as economically as possible. Polly Woodside was built at the shipbuilding yard of Workman, Clark and Co, Queens Island, Belfast during 1885, for William J. Woodside. She was launched on 7 November 1885, the performed by the owners wife, Mrs Marian Woodside. In sixteen voyages between December 1885 and August 1903 she made a number of arduous passages around Cape Horn, the Polly Woodsides operating crew, including master and mate was generally less than 20. In 1904 Polly Woodside was sold to A. H. Turnbull of New Zealand and renamed Rona after Miss Rona Monro, valued in 1906 at £4,300, Rona generally operated on the New Zealand–Australian run, carrying timber, cement and coal. The ship changed hands in 1911 for £3000 to Captain Harrison Douglas, of New Zealand, because of the heavy loss of shipping in the 1914–1918 war, Rona traded between New Zealand ports and San Francisco, carrying case oil and copra. Two mishaps occurred in the last years of the ships sailing career, in March 1920 the schooner W. J. Pirie, under tow in San Francisco harbour, collided with Rona at anchor, carrying away her headgear. Then in June 1921 the Rona, carrying a cargo of coal, grounded on Steeple Rock, the shingle bottom caused little damage and she was able to be towed into Wellington harbour. However, some slight stress fractures to the hull plating could still be seen when the ship was dry-docked in 1974, maritime historian Georg Kåhre has described the early 1920s as the final abandonment of sail by most of the worlds maritime nations. In the hectic economic climate of the war there had been no question of scrap prices. However, by 1922 this had changed, World freight rates were sliding in the post war slump, what had been marginal before was now uneconomic. Falls of Clyde is the last surviving iron-hulled, four-masted full-rigged ship, and the only remaining sail-driven oil tanker. Designated a U. S. National Historic Landmark in 1989, she is now a museum ship in Honolulu and she is currently not open to the public. In September 2008, ownership was transferred to a new organization, the Friends of Falls of Clyde. Efforts to raise $1.5 million to get the ship into drydock have not succeeded as of 2015, an additional $30 million may be needed to fully restore the ship. In August,2016, the Harbors Division of the State of Hawaii impounded the ship, efforts are underway to convince the Governor to preserve the ship, including an online petition. Falls of Clyde was built in 1878 by Russell and Company in Port Glasgow, Scotland, launched as the first of nine iron-hulled four-masted ships for Wright and Breakenridges Falls Line. She was named after the Falls of Clyde, a group of waterfalls on the River Clyde and her maiden voyage took her to Karachi, now in Pakistan, and her first six years were spent engaged in the India trade. She became a tramp pursuing general cargo such as lumber, jute and wheat from ports in Australia, India, New Zealand, and the British Isles. To economize on crew, Matson rigged Falls of Clyde down as a barque, at the same time, he added a deckhouse and rearranged the after quarters to accommodate paying passengers. 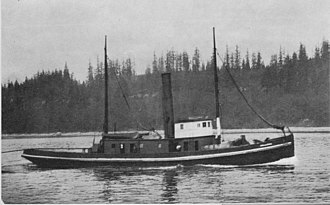 From 1899 to 1907, she made over sixty voyages between Hilo and San Francisco, carrying general merchandise west, sugar east and she developed a reputation as a handy and commodious vessel, averaging 17 days each way on her voyages. In 1907, the Associated Oil Company bought Falls of Clyde, ten large steel tanks were built into her hull, and a pump room and generator fitted forward of an oil-tight bulkhead. 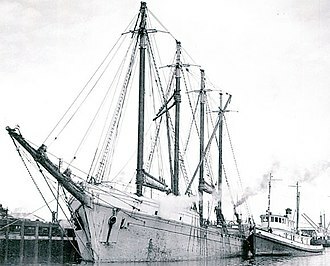 In this configuration she brought kerosene to Hawaii and returned to California with molasses for cattle feed, in 1927, she was sold to the General Petroleum Company, her masts cut down, and converted into a floating fuel depot in Alaska. 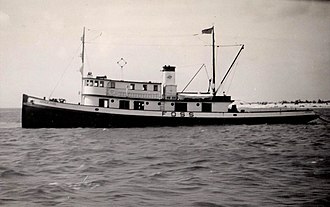 In 1959 she was purchased by William Mitchell, who towed her to Seattle, Washington, in 1963, the bank holding the mortgage on Falls of Clyde decided to sell her to be sunk as part of a breakwater at Vancouver, British Columbia. Brooke Marine was a Lowestoft-based shipbuilding firm. The company was founded in 1874 as a foundry by John Walter Brooke, until 1911 the company, which produced engines and motor cars, sub-contracted its boat building operations to another firm in Oulton Broad. In 1911 it opened a shipyard on the side of Lake Lothing and began to produce its own craft. Car production stopped in 1913, although the company continued producing engines until 1938, during World War I the company established a munitions factory. Following the war, the shipyard was expanded to produce boats up to 52 feet in length, during World War II, the company produced and serviced motor launches and landing craft for the Royal Navy and other Allied forces. In 1940, the company was acquired by Harry Dowsett and renamed Brooke Marine, in 1954, a new shipyard was built on the south side of Lake Lothing. The old yard was closed in 1955, and in 1975 was sold, the first ships produced at the new yard were twenty fishing trawlers ordered by the Russian government. Over 300 craft were produced in the yard. In 1968 the company won the Queens Award to Industry for Export Achievement, in July 1977 the company was nationalised and became part of British Shipbuilders until a management buy-out in 1985. In 1987, Brooke Marine closed down and was put up for sale, the dockyard and facilities were purchased in May, with the new owners trading under the name Brooke Yachts. The company continued until September 1992, when it ceased trading, receivers sold off all shipbuilding equipment in 1993. The name and some assets of Brooke Marine were acquired in 2006 by Michael Fenton, Brooke Marine Yachts Ltd traded until 2009. The shipyard was purchased by an investment company which now leases many of the original buildings to a diverse range of businesses many of which are marine orientated. In October 2014, an application for Brook Peninsula & Jeld Wen submitted by Cardy Construction Ltd to Waveney District Council for a £150 million was granted consent development. Demolition of the industrial units and residential-led mixed use redevelopment for residential use of up to 850 dwellings or 950,000 sqft, up to 1774sqm commercial. City of Adelaide is a clipper ship, built in Sunderland and launched on 7 May 1864. The ship was commissioned in the Royal Navy as HMS Carrick between 1923 and 1948 and, after decommissioning, was known as Carrick until 2001. At a conference convened by HRH The Duke of Edinburgh in 2001, the decision was made to revert the name to City of Adelaide. City of Adelaide was built by William Pile, Hay and Co. for transporting passengers, between 1864 and 1887 the ship made 23 annual return voyages from London and Plymouth to Adelaide, South Australia. 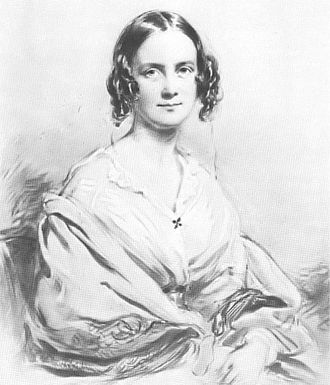 During this period she played an important part in the immigration of Australia, on the return voyages she carried passengers and copper from Adelaide and Port Augusta to London. From 1869 to 1885 she was part of Harrold Brothers Adelaide Line of clippers, after 1887 the ship carried coal around the British coast, and timber across the Atlantic. In 1893 she became a hospital in Southampton, and in 1923 was purchased by the Royal Navy. Converted as a ship, she was renamed HMS Carrick to avoid confusion with the newly commissioned HMAS Adelaide. HMS Carrick was based in Scotland until 1948 when she was decommissioned and donated to the Royal Naval Volunteer Reserve Club, Carrick remained on the River Clyde until 1989 when she was damaged by flooding. In order to safeguard the vessel she was protected as a listed building, Carrick was recovered by the Scottish Maritime Museum the following year, and moved to a private slipway adjacent to the museums site in Irvine. Restoration work began, but funding ceased in 1999, and from 2000 the future of the ship was in doubt, in 2010, the Scottish Government decided that the ship would be moved to Adelaide, to be preserved as a museum ship. In September 2013 the ship moved by barge from Scotland to the Netherlands to prepare for transport to Australia. In late November 2013, loaded on the deck of a ship, City of Adelaide departed Europe bound for Port Adelaide, Australia. City of Adelaide is the worlds oldest surviving clipper ship, of two that survive — the other is Cutty Sark. With Cutty Sark and HMS Gannet, City of Adelaide is one of three surviving ocean-going ships of composite construction to survive. Star of India was built in 1863 at Ramsey in the Isle of Man as Euterpe, a full-rigged iron windjammer ship. After a full career sailing from Great Britain to India and New Zealand, retired in 1926, she was not restored until 1962–63 and is now a seaworthy museum ship home-ported at the Maritime Museum of San Diego in San Diego, California. She is the oldest ship still sailing regularly and the oldest iron-hulled merchant ship still floating, the ship is both a California Historical Landmark and United States National Historic Landmark. She was launched on 14 November 1863, and assigned British Registration No.47617, euterpes career had a rough beginning. She sailed for Calcutta from Liverpool on 9 January 1864, under the command of Captain William John Storry, a collision with an unlit Spanish brig off the coast of Wales carried away the jib-boom and damaged other rigging. The crew became mutinous, refusing to continue, and she returned to Anglesey to repair,17 of the crew were confined to the Beaumaris Jail at hard labor. Then, in 1865, Euterpe was forced to cut away her masts in a gale in the Bay of Bengal off Madras and limped to Trincomalee, Captain Storry died during the return voyage to England and was buried at sea. In late 1871 she began twenty-five years of carrying passengers and freight in the New Zealand emigrant trade, the fastest of her 21 passages to New Zealand took 100 days, the longest 143 days. She made ports of call in Australia, California, a baby was born on one of those trips en route to New Zealand, and was given the middle name Euterpe. 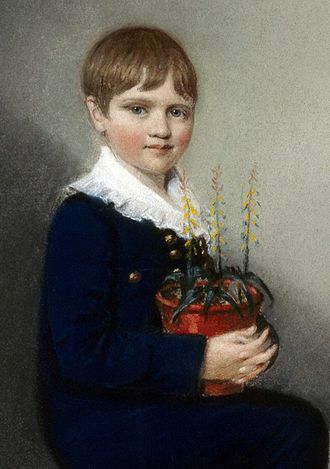 Another child, John William Philips Palmer, was born on the 1873 journey to Dunedin, New Zealand and she was registered in the United States on 30 October 1900. In 1906, the Association changed her name to be consistent with the rest of their fleet and she was laid up in 1923 after 22 Alaskan voyages, by that time, steam ruled the seas. In 1926, Star of India was sold to the Zoological Society of San Diego, the Great Depression and World War II caused that plan to be canceled, and it was not until 1957 that restoration began. Lady Elizabeth was an iron barque of 1,155 tons built by Robert Thompson Jr. of Southwick and launched on 4 June 1879. Robert Thompson Jr. was one of the sons of Robert Thompson Sr. who owned and operated the family ran shipyard J. L. Thompson & Sons, Thompson Jr. eventually left the family business in 1854 to start his own shipbuilding business in Southwick, Sunderland. The ship was built for John Wilson as a replacement for the 658-ton, 1869-built barque Lady Elizabeth which sank off Rottnest Island, the builders of the second Lady Elizabeth had built the first ship. The ship had three masts and was just under average size compared to barques built by Robert Thompson, the Lady Elizabeth was still the seventh largest ship the firm built. John Wilson remained owner of Lady Elizabeth and was captained by Alexander Findley from Montrose until 15 March 1884 when he took out a number of loans from G. Oliver, eventually John Wilson declared bankruptcy and all of his ships, including Lady Elizabeth were sold off. The new owner was George Christian Karran who purchased the ship a few months later, Karrans family owned a number of ships but this was George Christian Karrans first ship. George Christian Karran captained the ship for a few years, after owning the ship for a few years, Georges elder brother Robert Gick Karran died leading George to take command of Manx King. However, he remained owner of Lady Elizabeth until 1906, in 1906 Lady Elizabeth was purchased by the Norwegian company Skibasaktieselskabet for £3,250. The company was managed by L. Lydersen and Lady Elizabeth was captained by Peter Julius Hoigh, on 23 February 1884, Lady Elizabeth suffered substantial damage from a hurricane. She sustained damage to the front of the deck after it was stoved in. Many of her sails were lost or severely damaged, despite the damage, the ship was able to make it to port in Sydney, Australia where six crew members jumped ship. Another death occurred on the voyage when William Leach fell from aloft and this was the third voyage under the command of Captain Karran. An ad placed in October 1900 for Lady Elizabeth. Lady Elizabeth can be seen on the left in this 2007 photo of the harbor. This early photograph of Wallowa towing is believed to have been taken somewhere in Alaska during the Klondike Gold Rush (1898-1900). Annual tugboat races have long been held at Puget Sound ports, but became more popular after the success of "Tugboat Annie". After its 1934 rebuild, Arthur Foss (second from right) was always the favorite and frequent winner, capable of up to 13 knots. 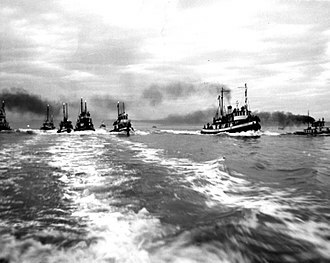 This photograph was taken in 1940 on Commencement Bay. The large lumber schooner Commodore, in tow of the tugboat Arthur Foss, arrives at Los Angeles in record time, 1936. 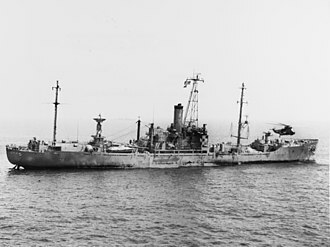 Arthur Foss was the last vessel escape Wake Island on December 8, 1941 (December 7 on the U.S. side of the International Date Line). This photograph was taken on December 5. The Lowestoft Defender at Heybridge Basin. The fast attack craft was built by Brooke Marine in the 1970s for the Royal Navy of Oman.